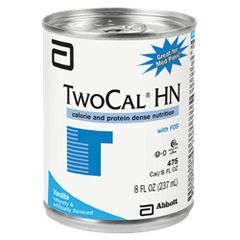 TwoCal HN is a nutritionally complete, high-calorie liquid food designed to meet the increased protein and calorie needs of stressed patients and patients requiring low-volume feedings. Vanilla: Water, Corn Syrup Solids, Sodium and Calcium Caseinates, Corn Maltodextrin, High Oleic Safflower Oil, Sugar (Sucrose), Medium Chain Triglycerides, Canola Oil, Fructooligosaccharides, Potassium Citrate, Magnesium Chloride, Calcium Phosphate, Natural and Artificial Flavors, Soy Lecithin, Sodium Citrate, Ascorbic Acid, Choline Chloride, Taurine, L-Carnitine, Zinc Sulfate, Ferrous Sulfate, dl-Alpha-Tocopheryl Acetate, Niacinamide, Calcium Pantothenate, Manganese Sulfate, Cupric Sulfate, Thiamine Chloride Hydrochloride, Pyridoxine Hydrochloride, Riboflavin, Vitamin A Palmitate, Folic Acid, Biotin, Chromium Chloride, Sodium Molybdate, Potassium lodide, Sodium Selenate, Phylloquinone, Cyanocobalamin, and Vitamin D3. (FAN 7960-08) Contains milk and soy ingredients. Butter Pecan: Water, Corn Syrup Solids, Sodium and Calcium Caseinates, Corn Maltodextrin, High Oleic Safflower Oil, Sugar (Sucrose), Medium Chain Triglycerides, Canola Oil, Fructooligosaccharides, Potassium Citrate, Magnesium Chloride, Calcium Phosphate, Soy Lecithin, Artificial Flavors, Sodium Citrate, Ascorbic Acid, Choline Chloride, Taurine, L-Carnitine, Zinc Sulfate, Ferrous Sulfate, dl-Alpha-Tocopheryl Acetate, Niacinamide, Calcium Pantothenate, Manganese Sulfate, Cupric Sulfate, Thiamine Chloride Hydrochloride, Pyridoxine Hydrochloride, Riboflavin, Vitamin A Palmitate, Folic Acid, Biotin, Chromium Chloride, Sodium Molybdate, Potassium lodide, Sodium Selenate, Phylloquinone, Cyanocobalamin, and Vitamin D3. (FAN 7960-02) Contains milk and soy ingredients. LOST weight, but NEEDED TO! Nutritional. Good Value. Acts Quickly. Simple To Take. Just after my 57th birthday, around July 2017, I found I had cancer on the back of my tongue. As treatment got going I found I could not eat anything. Severe Thrush made food either taste horrible or it burned my mouth terribly. Swallowing became very difficult. I finally gave in and got the PEG feeding tube. I used TwoCal for about 6 months. I lost about 80 pounds during this! But I was very overweight. I retained most of my strength eating by tube about 4 to 4.5 cans on average per day. I DID taste it later when I could and it tasted pretty decent. But it did keep me going when the doctors were concerned and watched my labs carefully the whole time. I went from about 365 to 290 during that time. Crazy thing is I feel SOOO much better after losing that weight, but the TwoCal kept me going very well, even though I was losing weight. I lost some muscle also, but I know I would have lost a lot more. I was not eating the garbage that was keeping the weight on. Now I understand why that worked and how it kept me from starving. I recommend it highly. This was paid for by insurance, but I would have paid out of pocket if I needed to! It showed me just how much difference wheat I ate made to me. by Blarney77 from Wichita, Ks. This product is for my son who is g-tube fed. Taste doesn't matter. What I like about it is the high caloric content. My son can not take in alot of volume so this help us to give him the calories he needs. I don't know what we would do without it. However my son has to intake alot of water because of its richness. This was the only place I found to private pay & do it online. Provides 500 calories and necessary nutrients in a creamy pleasant tasting drink. Easy to digest. After all else failed,This worked! Very thin. Very stressed. Very busy. My daughter is 31 yrs old and weighed 91 lbs.Dr. 's could not give any reason for her size.She does eat but does not snack much.I doubled up on her meals and not one lb was addded to her body.She is otherwise very healthy.Also her periods had stopped. A friend gave her a case,she did not like it.So one night I surprised her by mixing it in the smoothie! She never knew I did it and kept saying how much she loved it.After about a week she gained 3lbs,so I told her and now she has one every night mixed with her smoothie.She drinks half and has the second half with breakfast. Finally my daughter looks and feels like a woman! Oh yea and her periods are back. Produces Results. Keeps weight on. Acts Quickly. Having throat cancer I was not able to swallow. For seven months I was tube fed.I fed myself with 4-cans of TWOCAL-HN daily. It kept my weight up. Today one year later I now swallow 2-cans daily as it still helps to keep my weight up. What a great product!!! by Bob the surviver from Tinley Park, Il. I had a stroke back in March and have lost my appetite. I have lost 15 to 20 ponds. I take a can of TwoCal a day. 1/2 a can at breakfast and then 1/2 a can at night. I have used about 1 1/2 weeks worth and have not have any weight added. This should be 3 lbs. Please advise. Thank you. You are only consuming about 450 calories per can each day (1/2 can morning and 1/2 can evening). How many calories are you taking in total including your regular meals? also your metabolism? maybe you are required to consume 1500-2000 calories per day to maintain your weight and about 2500 to gain weight. I would suggest to drink 2-3 cans per day if you want to gain weight. I hope this helps. God bless. We are going to Spain and then on across Atlantic cruise. my wife is on a G tube and uses 2-cal. Is it available in Spain. How do we get it. Is there a powder form. Any suggestions. My Mom had a stroke and has been eating very little ever since. Her swallowing reflex is fine but she seems to choose not to eat. Is this product appropriate and do you ship to Canada? I was using ensure on my husband who had cancer but he had to take too much of it to get his daily intake of calories. A nutritionist recommended TwoCalHN and he did start putting the weight on. The only thing was my husband was taking it through a feeding tube. Maybe you could make some milk shakes with it but I do highly recommend this product and even told some doctors about it who hadn't heard of it. Hope this helps. If you need any other info please feel free to contact me. Goodluck.